If you do not write a will, then the probate court system will decide how your assets will be divided among your heirs after your death. The division of assets will proceed according to state law and a judge’s decision about what your intentions may have been. A lengthy probate process could cost your family quite a bit of time and money, and possibly distribute the estate without addressing their specific needs. Can I Appoint a Guardian for My Children? This is one of the most important reasons to draw up a will, particularly if your family situation has been complicated by divorce, remarriages and legal issues among natural parents, step-parents and siblings. If you do not designate a guardian for your minor children, the probate court will nominate one after considering any application for that role that is submitted by one of your relatives or friends. Do I Need a Will to Deal With Everything I Own? Some of your property can be transferred to your heirs outside of the terms of a will. If you have a trust account, pension, retirement account or life insurance account, you have already named a beneficiary to whom the assets will pass by law and outside of the terms of a will. Also, if you have joint accounts with your spouse, and the terms of the account include the “right of survivorship,” then the assets automatically pass to the survivor. What Happens to Money I Owe? Debts cannot be discharged by your death, and your creditors will have the right to submit claims on your estate. These claims will be evaluated by the probate court and debts will be paid out of your estate before the assets are distributed to your heirs. This includes any estate taxes owed to the IRS and to the state of residence. You may draw up a will on your own, and there are several publications and websites that can help you do this. You have to sign the will, and have it witnessed and possibly notarized. You may amend the will by adding codicils, which have to also be signed and witnessed. If there are major changes that need to be made to the will, you should draw up a new one. You would be well advised to keep a copy of the will in a safe place, such as a safe-deposit box, or submit it to your attorney for safekeeping. 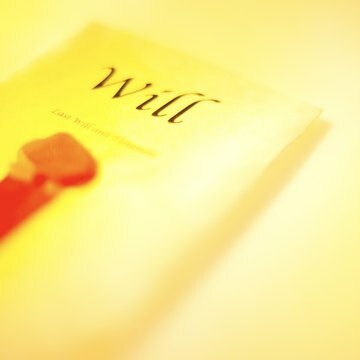 A copy of the will should also be placed among your personal effects, and you should let your executor know of the will's existence so that it can be found and put into effect after your death. Estate planners sometimes recommend living trusts over wills, but the choice is one of personal preference. Each offers advantages the other does not have, and there are drawbacks to each as well. In some ways, they are very similar. Which works best for you depends on your family situation, your finances and how your want your property distributed after your death.